Avoiding secondhand smoke can be simple enough when you are in the comfort of your own home, but how can you avoid it when traveling? You are exposed to secondhand smoke when you breathe in pollutants in the air from cigarette smoke and other tobacco products. For people with the chronic obstructive pulmonary disease or ​COPD, secondhand smoke exposure can prompt an exacerbation of symptoms, which can lead to hospitalization. Traveling can put people with COPD at particular risk for possible exposure. For those without COPD, you may want to avoid the 7000 chemicals and 70 known carcinogens in secondhand smoke. Although many cities and communities have made great strides in banning smoking from public buildings, restaurants, and parks, there are still parts of the world where smoking is allowed everywhere—even on flights. The best way to prevent exposure to secondhand smoke is to plan ahead and to advocate for yourself. Here are suggested ways to avoid secondhand smoke and the COPD exacerbations that may come with it while traveling. When making a reservation in some parts of the world, non-smoking is the assumed preference unless you request a smoking room. By the same token, however, some places will automatically assume you want a smoking room if you do not explicitly request non-smoking accommodations. Don’t take a chance. Whether you are booking a hotel room or a cabin on a cruise ship, always request a non-smoking room. 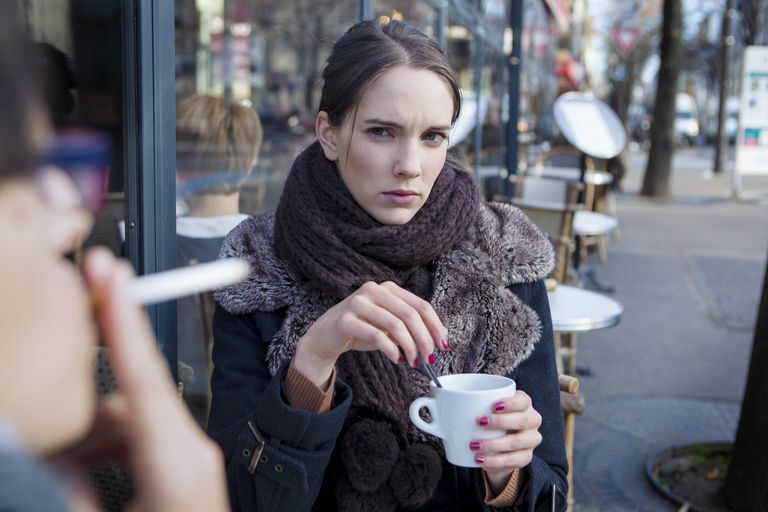 If you can’t avoid secondhand smoke in public places, avoid breathing it in by covering your mouth in smoky areas. A filter mask, such as the N95 respirator mask, which is shown to block 95 percent of air particles, is a handy and lightweight method to prevent exposure. If you are fashion conscious, you can cover the mask with a lightweight scarf. Or, try one of the new fashionable high-filtration masks, such as the Vogmask, which comes in a variety of colors and patterns. If you can’t stay in a smoke-free hotel, keep your clothes stored in a garment bag or suitcase to keep them from absorbing cigarette smoke. If the dresser in the hotel is older and smells of cigarette smoke, the best thing to do is to not use it and keep your clothes in your suitcase. Likewise, if you spend time in smoke-filled areas, causing your clothes to smell, store them in a separate bag away from the rest of your clothes. Don’t let your health care regimen take a vacation while you travel. Be sure to pack extra medicine and take it as prescribed. In addition, stay hydrated and don’t skimp on sleep. Listen to your body. Don’t push yourself too hard, which can wear down your body and make you more susceptible to a COPD exacerbation. Also, be sure to practice good hand washing hygiene and to use hand sanitizer whenever possible to avoid catching germs. This is especially important on airplanes, cruise ships, and other public transportation. Health Risks of Secondhand Smoke. American Cancer Society.